According to market values, Apple's hand-held tech is worth much more than Microsoft's software. It only took a few decades, but Microsoft is no longer the top technology company around. According to estimated market value yesterday, Apple managed to overtake the corporation behind Windows and our beloved Xbox 360s. At the closing of the stock market yesterday, Microsoft was estimated to be worth $219.18 billion while Apple was worth slightly more at $222.12 billion. This is a massive change of fortune for Apple, which nearly died an ignoble death in the mid-90s thanks to its dire finances. Things started to change when Steve Jobs came back to the company in 1996, when things began to turn around and Apple started putting out computers and devices that people actually wanted to buy again. The secret to Apple's success is two-fold. On one hand, its computers are certainly selling very well, but twice as much revenue is coming in from its various handheld devices. According to Wired, nearly 200,000 iPads alone are being sold each week, which is more than the number of Mac computers moved from stores. Granted, this could be a temporary change in the rankings, but it certainly is significant since Microsoft has managed to hold onto the top spot for so long simply because it has become the status quo for the vast majority of computer users. Apple, on the other hand, is constantly working to increase its momentum in the technology markets by releasing new/improved products on a regular basis. As the New York Times explained, "Apple is in a constant battle to one-up itself." 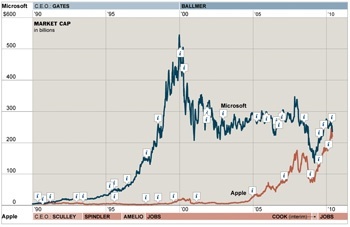 Part of the position change is also due to the fact that Microsoft has lost roughly half of its value since 2000. At least some of the blame for this has been assigned by experts to the various struggles the company has faced with its efforts to be a part of the gaming/consoles, music players, mobile phones, and search engine markets. That said, roughly 90% of users still operate Windows computers and over 500 million people use Microsoft Office software. While Apple isn't commenting on the shift, Microsoft's CEO Steve Ballmer doesn't seem openly concerned about it. "No technology company on the planet is more profitable than we are," he said when he was asked about it while visiting India to tout Microsoft's cloud-computing technology.